Counseling is an investment. It’s an investment in you. An investment in the healing of present and past pain so it doesn’t continue to impact you in the same way. 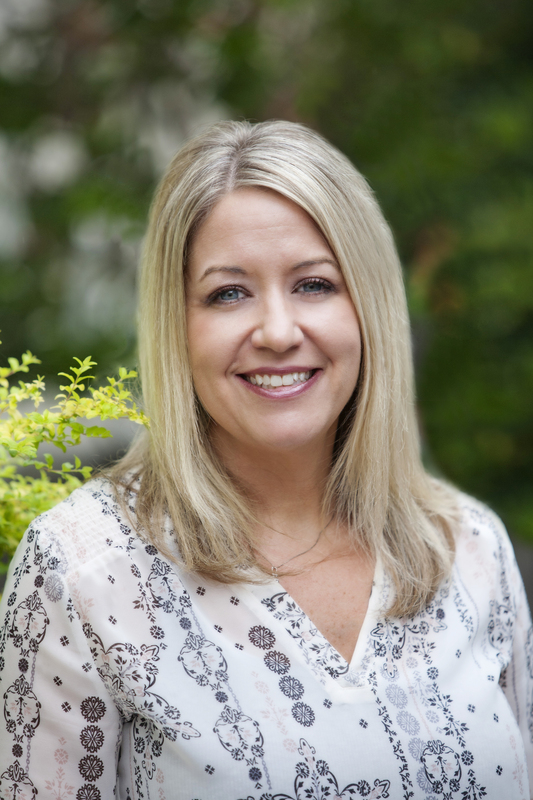 Counseling isn’t just another person to talk to but sitting with a highly trained person who is skilled to be fully present with you, fully attuned to what you say (verbally and non-verbally), and trained to see connections and patterns that you can’t see. This just scratches the surface of what a counselor does and doesn’t cover the hours of research or prep that they do for each client they see. 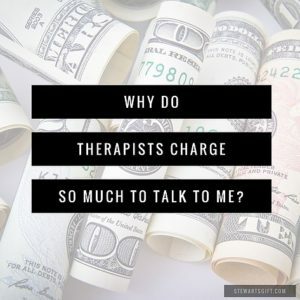 Since counseling is a big investment, you want to get the most out of the time (and money) you spend in therapy. Here are some suggestions about making the most out of counseling. Know what you are looking to gain. Know what you are looking for. Are you looking to reduce anxiety, heal a past hurt, mend a relationship? Whatever it is, have some idea. This gives both you and your counselor a goal to work towards. Now you very well may find other goals along the journey. This happens frequently. Having an initial idea of what you are looking for, makes it easier to measure progress. Be ready. Most of us want change but not all of us are ready for it. We may be scared of change or doubt it is even possible. I know it is scary to consider a change. But if you are looking for life to be different, what do you have to lose? Readiness to change is a combination of both openness and willingness. Open to go down whatever road the healing journey takes you and willing to do the work necessary to create change. Be honest with your counselor, what do you have to lose? Counselors are an interesting breed of people. They aren’t shocked or surprised by hurt, trauma, and pain. They don’t judge. They want you to feel safe to share your deepest pain and secrets. They are bound by confidentiality and won’t share it with anyone. Why not be completely open and honest with them about what is really going on? If you aren’t, you will delay your healing and lengthen the amount of time you are in therapy. Be open to try what the counselor suggests both in session and out of session. Counselors spend a lot of time researching interventions that will help their clients on their healing journey. Interventions may be homework, letter writing, breathing skills, calming skills, journaling, art therapy, education, or experiential in session interventions. They may ask you to talk with an empty chair or close your eyes and visualize something. Whatever it is they ask you to do, I promise you, it is to benefit your healing journey. So be all in. Don’t try to rush the process. Counseling isn’t a quick, instant fix. It takes time to build the relationship, time for patterns to emerge and time for interventions to done and processed. Gaining insight and healing wounds takes time and isn’t a linear process but more of an up and down journey. So, don’t be in such a hurry that you don’t allow yourself the time to really sit with new insights and let them deepen. Build momentum. Counseling works by the momentum of meeting weekly. Insights are processed over the course of a week and built upon during the next session. If you don’t meet weekly with your therapist then the momentum slows down and the process takes longer. Sometimes the process loses it’s effectiveness because of the loss of momentum. My goal with my clients is to meet weekly, build momentum and the relationship, until it becomes therapeutically beneficial to take more time between sessions. Meaning, I want to work myself out of a job and am constantly assessing where I am with each client. Weekly momentum makes a huge impact on the time it takes to reach counseling goals. Be open to talking about the counseling relationship with your counselor. If you are uncomfortable or have any concerns about the relationship with your counselor bring it into session. You will notice that a lot of counselors automatically do this and are attuned to your shifts. 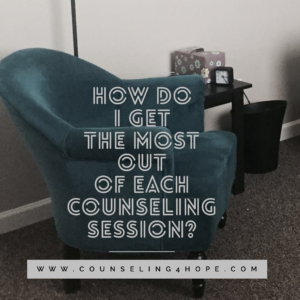 Discussing the relationship in session is a big part of the counseling process. If you are reacting to a counselor in a certain way, you’re probably reacting to someone in your life that way as well. Process it with your counselor so you can better understand you. Not sure that you are making progress or clicking with your counselor? Ask, talk about it. We’re trained to talk about the relationship and are completely okay with it!! Take note of insights you gain during the process. Counseling generates a lot of insight.Therefore, I would encourage you to write your insights down. You could take note of them in session, right after session, during the week as you reflect on the session, or all of the above. Insights are powerful and help us mentally shift and change. Taking note of them will help solidify the insights. Counseling is a valuable investment anytime you find yourself stuck and struggling in life, especially if you’ve had a complicated and painful life story. You may spend a season of time in counseling that changes your quality of life for the present and the future. Just take a minute to really think about that!! If you decide counseling would benefit you and live in the McKinney, Texas area, reach out and schedule a free phone consultation. If you don’t live close, I hope these tips help you make the most of your counseling journey. God doesn’t want you to live broken, ashamed, and stuck. Still not sure if the counseling investment is one you are ready to make? Click the image below to read a great article by my friend and colleague Allison Hutson, LPC-Intern supervised by David Dickerson, LPC-S.